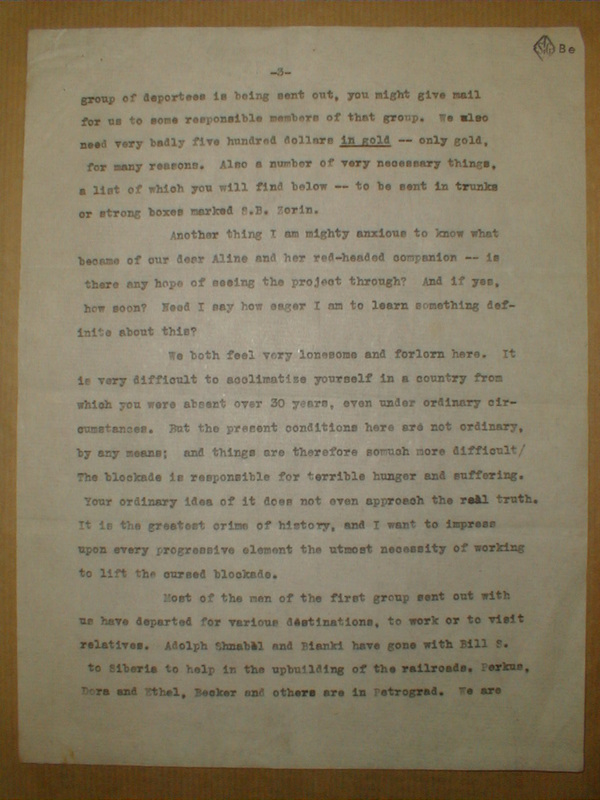 This letter is part of the International Institute for Social History's Alexander Berkman archive and appears in Anarchy Archives with ISSH's permission. Rather peculiar that I should write to you today, dear. Just a year ago, today, I was way down South literally "way down", without any word from you or other friends for three months. And now again two months have passed, and not a line from folks at home. Did I say 2 months, and is it really only 2 months? It is hard to believe. It feels more like 2 years --- if I did not fear that yo would think it a wild exaggeration, I should say twenty, not two, years. But that is how I really feel. And I know that E. feels the same way. We have, since we left you, lived over so much, received so many and variegated new impressions, seen so much that is wonderful and terrible, that it seems quite impossible that so much can be lived through in only two months. What makes things so much harder for us is the fact that we are in utter darkness concerning happenings at home, or what has befallen those dearest to us, and our friends and comrades in U.S. Till yesterday we had not seen an American paper, since Dec. 21. By sheer good luck we got hold of the N.Y. Call, dated Dec 21, 22, and the 25. We gather from it that you know what happened to us on the night of Dec. 20th. Also that you received the wireless sent you from the Buford, about Jan. 8th, saying that "all is well" ---that is all we could wire. We also believe that you received the radio we sent you from Petrograd, about our great reception on Soviet soil. But whether you received anything else, we know not, but are very anxious to learn. We sent you a number of letters from the English Channel, then again when we reached the Kiel Canal. Some letters were also mailed to you, St., etc. from Antwerp, and some messages and letters you were to receive in person through a friend we made on the ship, known as Mack. We directed him to call on Stella, in case you should happen to be out of town --- that is, we thought there was such a possibility. By this time all the mail and the man himself should have reached you or St. But how are we to know --- that's the hell of a problem. group of deportees is being sent out, you might give mail for us to some responsible members of that group. We also need very badly five hundred dollars in gold --- only gold, for many reasons. Also a number of very necessary things, a list of which you will find below --- to be sent in trunks or strong boxes marked S.B. Zorin. Another thing I am mighty anxious to know what became of our dear Aline and her red-headed companion --- is there any hope of seeing the project through? And if yes, how soon? Need I say how eager I am to learn something definite about this? We both feel very lonesome and forlorn here. It is very difficult to acclimatize yourself in a country from which you were absent over 30 years, even under ordinary circumstances. But the present conditions here are not ordinary, by any means; and things are therefore somuch more difficult/The blockade is responsible for terrible hunger and suffering. Your ordinary idea of it does not even approach the real truth. It is the greatest crime of history, and I want to impress upon every progressive element the utmost necessity or working to life the cursed blockade. getting acquainted with people and things here, where we may probably return again soon after we have spent a few more weeks in Petrograd. (We shall go to Petr. in a week or so, as we left all our things there.) 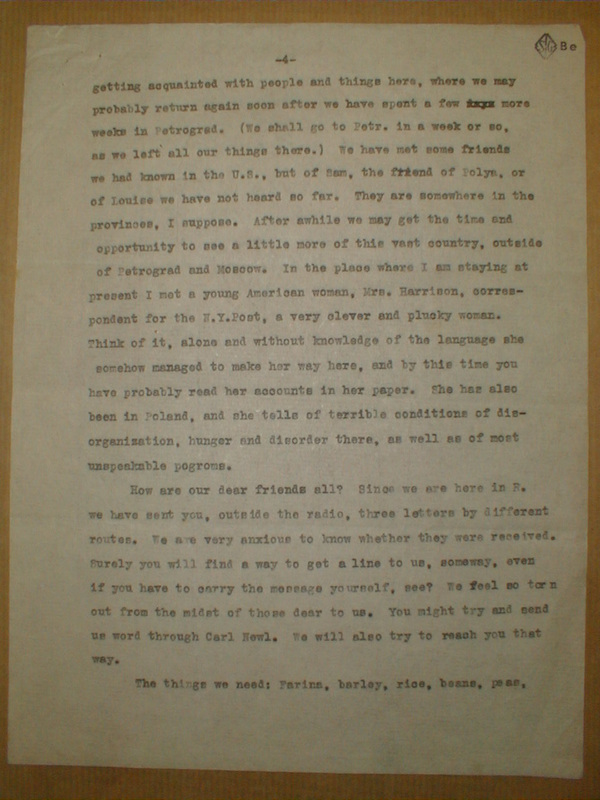 We have met some friends we had known in the U.S., but of Sam, the friend of Polyn, or of Louise we have not heard so far. They are somewhere in the provinces, I suppose. After awhile we may get the time and opportunity to see a little more of this vast country, outside of Petrograd and Moscow. In the place where I am staying at present I met a young American woman, Mrs. Harrison, correspondent for the N.Y. Post, a very clever and plucky woman. Think of it, alone and without knowledge of the language she somehow managed to make her way here, and by this time you have probably read her accounts in her paper. She has also been in Poland, and she tells of terrible conditions of disorganization, hunger and disorder there, as well as of most unspeakable pograms (sic). How are our dear friends all? Since we are here in R. we have sent you, outside the radio, three letters by different routes. We are very anxious to know whether they were received. Surely you will find a way to get a line to us, someway, even if you have to carry the message yourself, see? We feel so torn out from the midst of those dear to us. You might try and send us word through Carl Newl. We will also try to reach you that way. old ones, rubber heels, insoles. Half dozen outfits for Pancake, flower, grapenut, sugar, salt, dried fruit, condensed milk, condensed heat, (without the pots), cigarettes, pipes, and pipe tobacco, matches, a few good pocket lighters (to save matches, sold at United Cigar Stores), with stuff to fill them with, bacon; dozen cans each of salmon, sardines, kippered herring, preserves, jellies, me ts, corned beef; plenty of soup cubes, hard crackers, (made for soldiers -- the dried bread Bessie made was spoiled by the salt water) baking powder, yeast in cans, coffee, tea, cocoa, sweet chocolate in cakes, Fels Naphta Soap, soapine, etc. M O S T necessary: medicines, especially for colds, coughs, stokach (sic) disorders, quinine, aspirine, codeine, dry mustard, couple thermometers, etc. 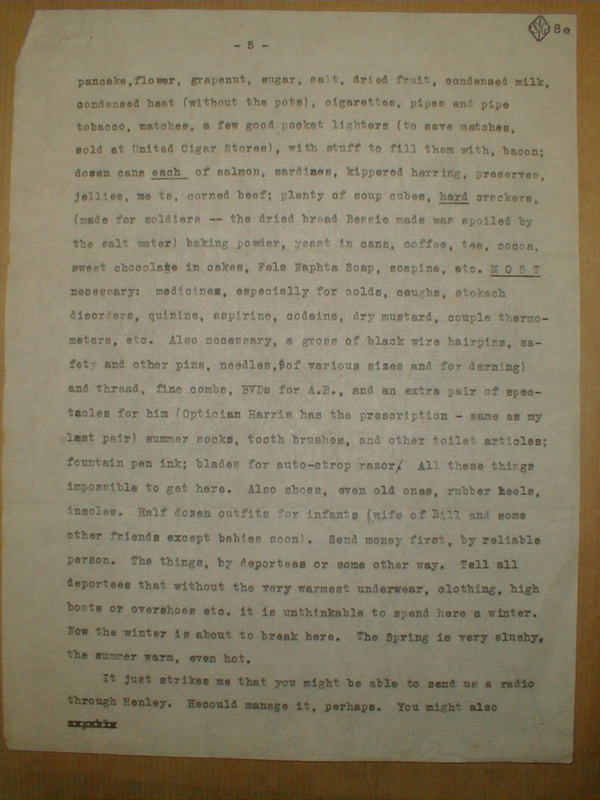 Also necessary, a gross of black wire hairpins, safety and other pins, needles, (of various sizes and for darning) and thread, fine combs, BVDs for A.B., and an extra pair of spectacles for him (Optician Harris has the prescription -- same as my last pair) summer socks, tooth brushes, and other toilet articles; fountain pen ink; blades for auto-strop razor. All these things impossible to get here. Also shoes, even infants (wife of Bill and some other friends except babies soon). Send money first, by reliable person. The things, by deportees or some other way. Tell all deportees that without the very warmest underwear, clothing, high boots or overshoes etc. it is unthinkable to spend here a winter. Now the winter is about to break here. The Spring is very slushy, the summer warm, even hot. Cable some word for us to Carl -- for him to transmit it to us (care of the Comissar of Foreign Affairs -- Chicherin -- Moscow) per wire, if possible, or per letter. 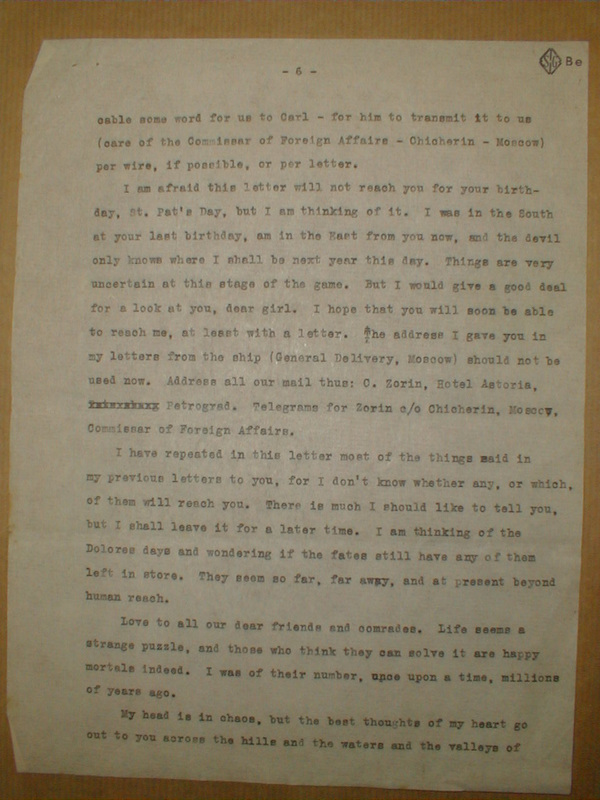 I am afraid this letter will not reach you for you birthday, St. Pat's Day, but I am thinking of it. I was in the South at your last birthday, am in the East from you now, and the devil only knows where I shall be next year this day. Things are very uncertain at this stage of the game. But I would give a good deal for a look at you, dear girl. I hope that you will soon be able to reach me, at least with a letter. The address I gave you in my letters from the ship (General Delivery, Moscow) should not be used now. Address all our mail thus: C. Zorin, Hotel Astoria, Petrograd. 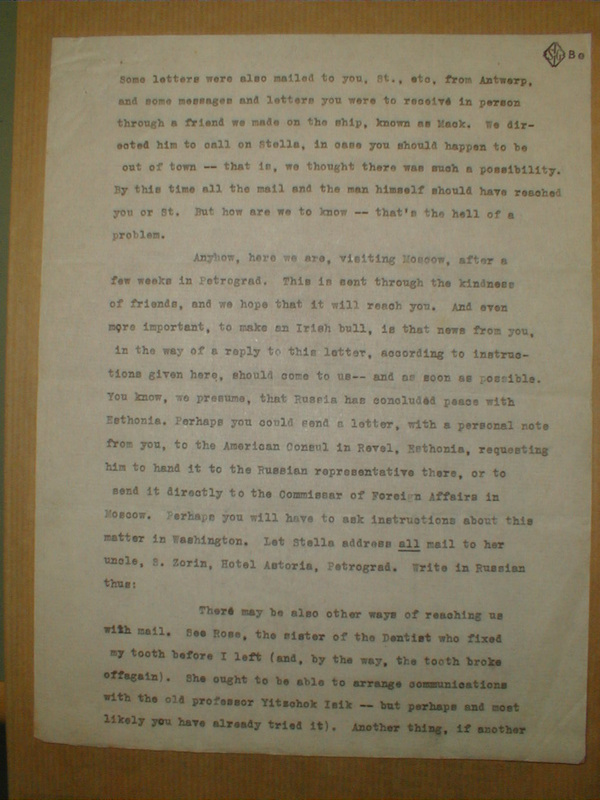 Telegrams for Zorin c/o Chicherin, Moscow, Commissar of Foreign Affairs. I have repeated in this letter most of the things said in my previous letters to you, for I don't know whether any, or which, of them will reach you. There is much I should like to tell you, but I shall leave it for a later time. I am thinking of the Dolores days and wondering if the fates still have any of them left in store. They seem so far, far away, and at present beyond human reach. Love to all our dear friends and comrades. Life seems a strange puzzle, and those who think they can solve it are happy mortals indeed. I was of their number, once upon a time, millions of years ago. 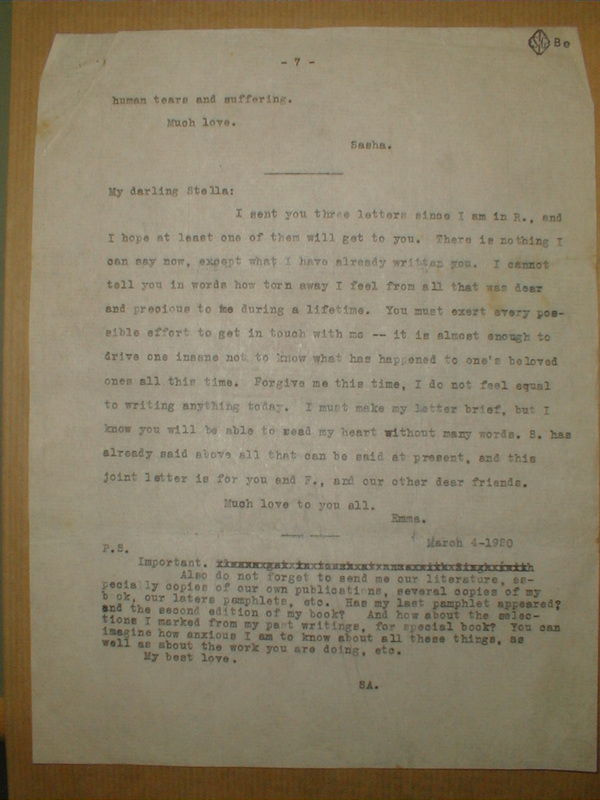 I sent you three letters since I am in R., and I hope at least one of them will get to you. There is nothing I can say now, except what I have already written you. I cannot tell you in words how torn away I feel from all that was dear and precious to me during my lifetime. You must exert every possible effort to get in touch with me -- it is almost enough to drive one insane not to know what has happened to one's beloved ones all this time. Forgive me this time, I do not feel equal to writing anything today. I must make my letter brief, but I know you will be able to read my heart without many words. 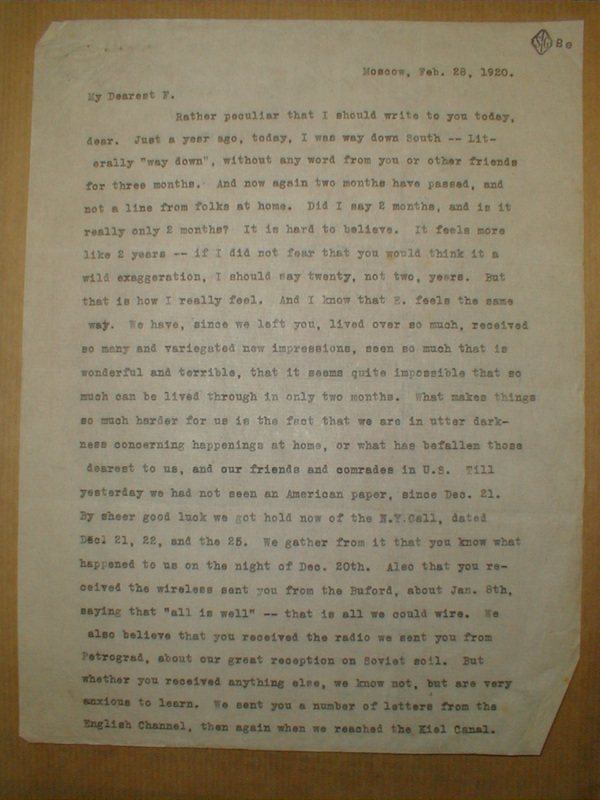 S. has already said above all that can be said at present, and this joint letter is for you and F., and our other dear friends. Also do not forget to send me our literature, especially copies of our own publications, several copies of my book, our laters pamphlets, etc. Has my last pamphlet appeared? And the second edition of my book? And how about the selections I marked from my past writings, for special book? You can imagine how anxious I am to know about all these things, as well as about the work you are doing, etc. This page has been accessed by visitors outside of Pitzer College times since December 22, 2000.